The Brush > Modifiers sub-palette allows you to modify the behaviour of certain brushes, especially the InsertMesh brushes. The Brush Modifier slider adds a secondary effect to your brush. There are two possible effects depending on which brush is selected. For the Standard Brush the Brush Modifier slider effects the amount of pinch (if positive) or the amount of inflation (if negative). For all other brushes the Brush Modifier slider acts as elevation. The slider determines how much elevation the brush will add (if positive) or subtract (if negative). The Smooth slider will apply a smooth that will follow the tail of a stroke. The Pressure slider will apply an auto pressure that adjusts by stroke speed. The Tilt Brush will apply a tilt to the brush when a stroke is applied to the surface. The slider represents the degree of angle. This feature is extremely useful in conjunction with alphas that would be for snake skin, lizard skin, fish skin, etc. The Constant Tilt button will keep the set degree of tilt in the Tilt Brush Slider the same through out the entire stroke. The Projection Strength slider affects how closely the inserted mesh will conform to the underlying surface. A low value will preserve the original shape of the inserted mesh with little or no adjustment to match the underlying surface. A high value will deform the inserted mesh so it conforms closely to the underlying surface. 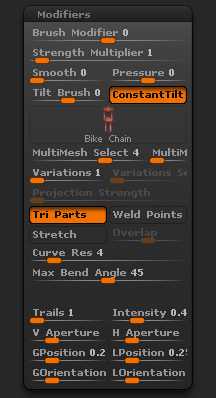 The Tri Parts mode enables use of an insert mesh comprised of three PolyGroups, with the middle one being replicated along the curve’s length. If an object is inserted into another and both have the same number of vertices at the boundary, this mode will attempt to weld the points where the two objects meet. Weld mode provides the best results when also combined with Stretch mode. This option bends the inserted mesh by following the curve shape. When disabled, the mesh is considered a hard body and will only be oriented by the curve rather than deformed. Also, when Soft Curve is enabled the mesh will twist naturally just as a ribbon would have a slight twist around something like an arm. Note: If the inserted mesh has too few polygons, Soft Curve mode can cause unexpected deformation if your curve makes an abrupt angle change. Tthis option changes the shape of the inserted element along the insertion axis. Depending on the slider value, it will stretch or skew the new object. This option is available only when Stretch mode is on. The Curve Resolution slider is used to increase the resolution of your curve for a smoother transition between the inserted meshes. This is ideal when you have drawn out a curve with a large brush size for purposes of object scale but would still like to have a smoother curve. The Max Bend Angle slider uses a change in direction (or angle) of the curve to define the behavior of the inserted mesh along the curve. A low value creates a very soft deformation of the curve while a high value creates sharp deformation. The Trails slider will apply multiple brushes at once along the stroke to the surface. For example, if the setting is at 50 then as you are applying your stroke ZBrush will be applying 50 instances of the same brush all at once as you continue along your stroke. If you adjust the slider to a higher setting you will see the stroke grow as you move along. The Intensity slider will control the intensity of the trails set. The V Aperture slider control the Vertical Aperture of an alpha in the Alpha Palette when Trails slider is set higher then 1. The H Aperture slider control the Horizontal Aperture of an alpha in the Alpha Palette when Trails slider is set higher then 1. The G Position slider controls the Trails global position falloff. The L Position slider controls the Trails local position falloff. The G Orientation slider controls the Trails global orientation falloff. The G Orientation slider controls the Trails local orientation falloff.